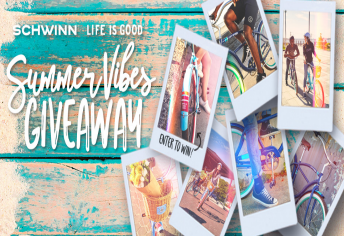 Life is Good – Schwinn Giveaway Sweepstakes – Win a Schwinn Cruiser bike! Win a Schwinn bike (2 winners)! ENTER SWEEPSTAKES HERE – Life is Good Sweepstakes page. ENTRY LIMIT – Each entrant may submit one (1) Entry during the Sweepstakes Period. ELIGIBILITY – The Life is Good – Schwinn Giveaway (the “Sweepstakes”) is open to legal residents of the 50 United States and the District of Columbia, who are 18 years of age or older. SWEEPSTAKES ENTRY PERIOD – The Sweepstakes begins on August 6, 2018 at 9:00AM CST and ends on August 20, 2018 at 9:00AM CST. PRIZES – There will be two (2) prizes awarded for the entire Sweepstakes Period. One winner will receive one (1) Men’s Life is Good™ cruiser bicycle in blue (Approximate Retail Value “ARV” $499.99) and one winner will receive one (1) Women’s Life is Good™ cruiser bicycle in blue (ARV $499.99, ARV of all prizes, $999.98). WINNER’S LIST – The names of winners and/or Rules will be posted on http://lifeisgoodschwinn.hscampaigns.com/ The winner list will be posted after winner confirmation is complete.